You're set on your basic gold-tone and silver-tone watches. And with a unidirectional bezel, magnified date window and luminous Tritnite accents, you know it doesn't just rely on its good looks to get by. Manufacturer Part Number 21927. The dial powers a 60-seconds subdial near 3:00, a date window near 4:00 with a visible date disk, a 10-hour subdial above 6:00 and a 30-minute subdial near 9:00. Luminous Tritnite accented markers fill the hour positions as hour and minute hands swim by with their own Tritnite touches. Model 25714. Case Color Stainless Steel. Band Material Stainless Steel. Case Material Stainless Steel. Watch Shape Round. Features Stainless steel band and case with green dial. 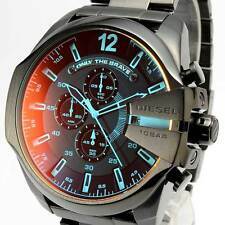 Features convenience - a good watch will give it all to you - perfect gift. The dial gets on the cut-out train with a layered design you'll love to look at. You won't even notice you're running behind with 60-seconds, 10-hour and 30-minute subdials doing their thing around the dial. Item Number 25013. Model 25013. Collection Subaqua. Case Size: 52mm. Water Resistant 20 ATM (20 atmospheres, 20 bars, 660 feet): Watch can withstand daily activities and may be worn for most types of diving, with the exclusion of diving that requires helium gases. SKU:item# DZ4318. Model number: DZ4318. Chronograph: Chronograph. It will cause fogging or water condensation inside of the case. However, if a failure occurred by an incidental/improper use (opening/closing the cover/lid, unfixed crown/button under water including missing over of internal parts, giving the watch a shock due to dropping or hitting), the trouble is a breach of warranty. Rotating bezel, screw back | ?. [ Release Date(yyyy/mm/dd) ]. the manufacturer will change contents, date and quantity for sale. We are treating new item, but there is possibility that item has tears, dents, dirts. Buckle: Diver. Case and Dial. Dial Material: Mother of Pearl, Oyster. Water Resistance. Case Size: 48.0mm. When a watch battery is changed, the gasket and seals must also be checked and/or replaced to maintain water resistance. Model 22591. Buckle: Diver. Water Resistant 20 ATM (20 atmospheres, 20 bars, 660 feet): Watch can withstand daily activities and may be worn for most types of diving, with the exclusion of diving that requires helium gases. Line Seamaster. Bracelet Scratches Moderate. Buckle / clasp Scuff Moderate. Buckle / clasp Dirt Moderate. Material (Case) Stainless steel. Crown Type Push. Case Scratches Slight. Case Back Scratches Slight. Model number: 1513441. It will cause fogging or water condensation inside of the case. Series: Jet. However, if a failure occurred by an incidental/improper use (opening/closing the cover/lid, unfixed crown/button under water including missing over of internal parts, giving the watch a shock due to dropping or hitting), the trouble is a breach of warranty. Model Invicta Pro Diver. Style Diver. Chronograph Type Chronograph. Water Resistant 20 ATM (20 atmospheres, 20 bars, 660 feet): Watch can withstand daily activities and may be worn for most types of diving, with the exclusion of diving that requires helium gases. Case Size: 40mm. Water Resistant 20 ATM (20 atmospheres, 20 bars, 660 feet): Watch can withstand daily activities and may be worn for most types of diving, with the exclusion of diving that requires helium gases. ID Invicta 22311. Model 22311. It's like the regular Pro Diver with a crown and function pushers on the right and "Invicta" etched on the left but leaves its own mark with a colored detail below the bezel. Case and Dial. Water Resistant 20 ATM (20 atmospheres, 20 bars, 660 feet): Watch can withstand daily activities and may be worn for most types of diving, with the exclusion of diving that requires helium gases. Model 28717. Material: Silicone, Polyurethane. Water Resistant 20 ATM (20 atmospheres, 20 bars, 660 feet): Watch can withstand daily activities and may be worn for most types of diving, with the exclusion of diving that requires helium gases. Model 26296. Case Size: 50mm. Water Resistant 20 ATM (20 atmospheres, 20 bars, 660 feet): Watch can withstand daily activities and may be worn for most types of diving, with the exclusion of diving that requires helium gases. Buckle: Diver. Case Size: 52mm. Components: Swiss. Case and Dial. Water Resistant 20 ATM (20 atmospheres, 20 bars, 660 feet): Watch can withstand daily activities and may be worn for most types of diving, with the exclusion of diving that requires helium gases. Model 18519. Buckle: Diver. Water Resistant 20 ATM (20 atmospheres, 20 bars, 660 feet): Watch can withstand daily activities and may be worn for most types of diving, with the exclusion of diving that requires helium gases. Case Size: 48mm. Water Resistant 20 ATM (20 atmospheres, 20 bars, 660 feet): Watch can withstand daily activities and may be worn for most types of diving, with the exclusion of diving that requires helium gases. Model 12917. Buckle: Diver. Water Resistant 20 ATM (20 atmospheres, 20 bars, 660 feet): Watch can withstand daily activities and may be worn for most types of diving, with the exclusion of diving that requires helium gases. Model 1197. Water Resistant 20 ATM (20 atmospheres, 20 bars, 660 feet): Watch can withstand daily activities and may be worn for most types of diving, with the exclusion of diving that requires helium gases. 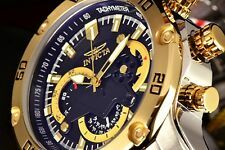 This Invicta has a water resistant to 100 feet (30 M). Case size: 48 mm. Buckle: Diver. Case and Dial. Series Pro Diver. Water Resistant 20 ATM (20 atmospheres, 20 bars, 660 feet): Watch can withstand daily activities and may be worn for most types of diving, with the exclusion of diving that requires helium gases. Item Number 24005. Buckle: Diver. Case and Dial. Collection Pro Diver. Water Resistant 20 ATM (20 atmospheres, 20 bars, 660 feet): Watch can withstand daily activities and may be worn for most types of diving, with the exclusion of diving that requires helium gases. Item Number 21920. Invicta's signature Pro Diver but with a little more umph. The Scuba edition makes the classic silhouette look so cool with a round silver-tone stainless steel case and a unidirectional rotating bezel. Model 24966. Dial Material: Glass Fiber. Case and Dial. Series Pro Diver. Water Resistant 20 ATM (20 atmospheres, 20 bars, 660 feet): Watch can withstand daily activities and may be worn for most types of diving, with the exclusion of diving that requires helium gases. Manufacturer Part Number 22322. Case Size: 50mm. Case and Dial. Water Resistant 20 ATM (20 atmospheres, 20 bars, 660 feet): Watch can withstand daily activities and may be worn for most types of diving, with the exclusion of diving that requires helium gases. It's an uncomplicated look with all the complications - check out those silver-tone sub dials at 3:00, 6:00 and 9:00. This is a nice look for weekends, evening, or even the office. Model Pro Diver. Series Pro Diver. Buckle: Diver. Model Invicta Pro Diver. Case and Dial. Chronograph Type Chronograph. Manufacturer Invicta. Crown Type: Push. Tone: Black. Bezel Color: Grey, Orange. Manufacturer Part Number 22319. Case and Dial. Water Resistant 20 ATM (20 atmospheres, 20 bars, 660 feet): Watch can withstand daily activities and may be worn for most types of diving, with the exclusion of diving that requires helium gases. Water Resistant 20 ATM (20 atmospheres, 20 bars, 660 feet): Watch can withstand daily activities and may be worn for most types of diving, with the exclusion of diving that requires helium gases. Manufacturer Invicta. Model 27543. Buckle: Diver. Case and Dial. Water Resistant 20 ATM (20 atmospheres, 20 bars, 660 feet): Watch can withstand daily activities and may be worn for most types of diving, with the exclusion of diving that requires helium gases. Manufacturer Part Number 80064. Buckle: Diver. Case Size: 48mm. Water Resistant 20 ATM (20 atmospheres, 20 bars, 660 feet): Watch can withstand daily activities and may be worn for most types of diving, with the exclusion of diving that requires helium gases. Buckle Type :Diver. Dial Color :Blue. Case & Dial. Series Pro Diver. Water Resistant 20 ATM (20 atmospheres, 20 bars, 660 feet): Watch can withstand daily activities and may be worn for most types of diving, with the exclusion of diving that requires helium gases. Case Size: 38mm. Tone: Gold. Manufacturer Invicta. Water-Resistant: Watch can withstand an accidental splash of water (like rain) but should not be worn while washing hands, bathing, or swimming. Series Angel. Model 25793. Your choice of dial color coordinates or contrasts at the center with a textured pattern you’ll want to take a second look at. You’ll find a date window and Tritnite accents as you find success all throughout your schedule. Model 23706. Material: Polyurethane, Stainless Steel. Water Resistant 20 ATM (20 atmospheres, 20 bars, 660 feet): Watch can withstand daily activities and may be worn for most types of diving, with the exclusion of diving that requires helium gases. Model 26177. Case Size: 51mm. Water Resistant 20 ATM (20 atmospheres, 20 bars, 660 feet): Watch can withstand daily activities and may be worn for most types of diving, with the exclusion of diving that requires helium gases. Case Size: 47mm. Buckle: Diver. Case and Dial. Series Pro Diver. Water Resistant 20 ATM (20 atmospheres, 20 bars, 660 feet): Watch can withstand daily activities and may be worn for most types of diving, with the exclusion of diving that requires helium gases. Manufacturer Part Number 22342. Case Size: 50mm. Case and Dial. Water Resistant 20 ATM (20 atmospheres, 20 bars, 660 feet): Watch can withstand daily activities and may be worn for most types of diving, with the exclusion of diving that requires helium gases.